I'ts the week that our vintage creators have been waiting for. Primrose will be featured all week on the blog!! Today we start with layouts!! Primrose is definitely one of my all time favourite collections from Bo Bunny. 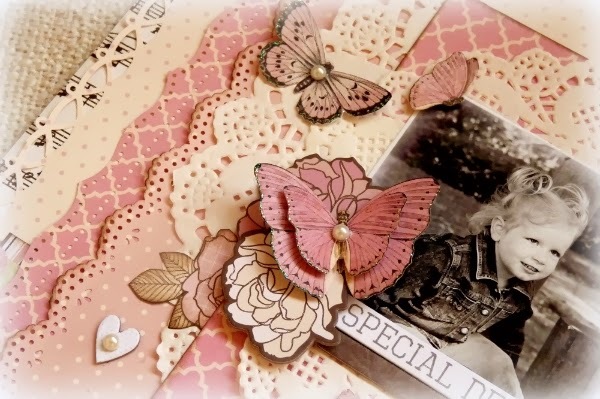 I always love to work with pink and butterflies are also some of the embellishments that I incorporate on almost all of my creations. 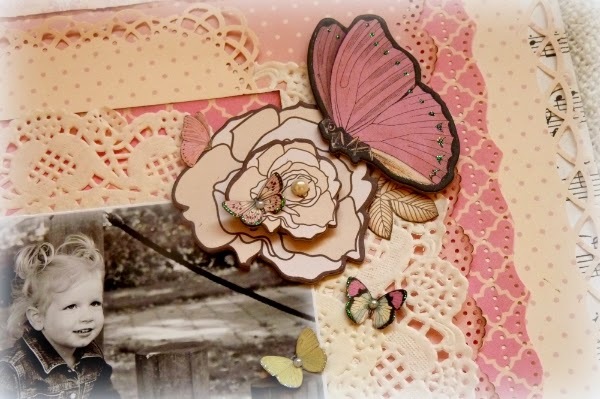 On this lay-out I decided to mix my favorite color with my favorite items to use, so I made a very pink lay-out with lots of butterflies flying all over it. I incorporated quite a lot of layers of paper and doilies in my lay-out. to make the different layers stand out a bit more, I punched alongside the edges. 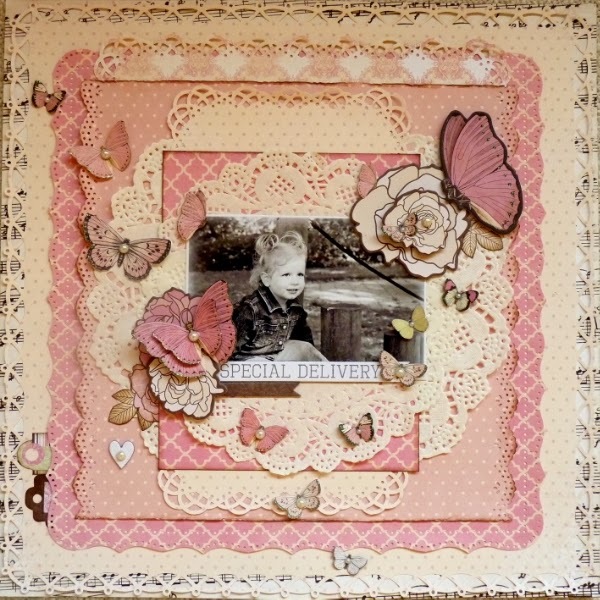 For embellishing my lay-out I made two clusters of chipboard flower and butterflies and also cut out a lot of different butterflies from the papers. The large butterflies are from the Noteworthy package, whereas the tiny butterflies are all cut out from the "Smile" paper. I added a pearl to the centers of most of the butterflies, as I find that it gives them a more elegant look. I also decorated the butterflies with some glitter glue. Primrose gives the perfect feminine touch to your projects. I love the color combo of pink and brown. The touch of green is just a bonus!! I edge punched 2 of the paper layers for a lacy effect. I used the Double Dot cardstock to create my blooms. I added a jewel brad to the centers. I used the solid side for the roses and the dot pattern side for the daisies. With leftover paper, I die cut a couple of tags and strung them with some string. I used pop dots under the banner for depth. Here are 3 more butterflies from the Noteworthy pack. Oh, your lay-out is so gorgeous, girly and sweet, Lisa! Lisa and Romy, these pages are STUNNING!!! Thanks for the inspiration. Love these papers!